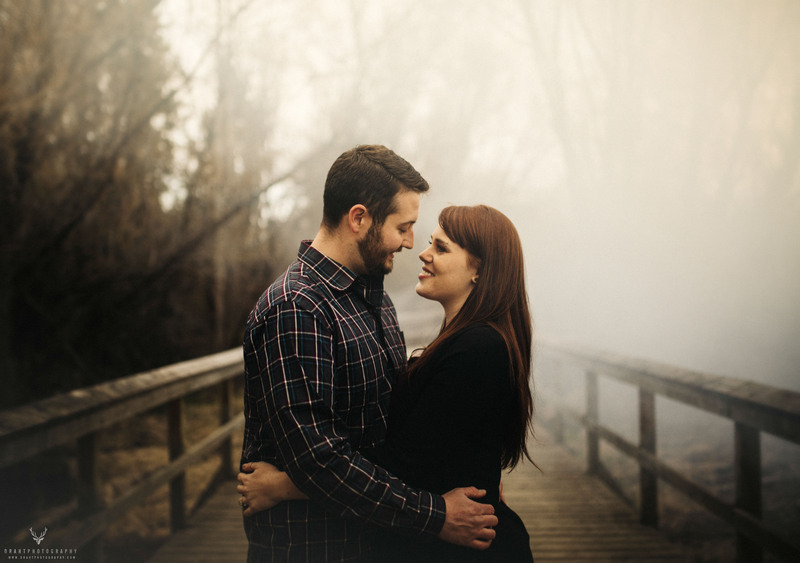 A few days ago I chatted about testing out a few smoke bombs. This is important, always make sure you have one, if not more, tests. Pyrotechnics can get pretty unpredictable. In my case, I found my white smoke bombs lasted pretty long – up to three minutes! Where my coloured ones last a little bit under a minute. That being said, Polson Park is already kind of misty. So we took advantage of that. If you’d like to see the gallery without my witty commentary, click here. Plus there’s an extra couple photos there. I’ve been experimenting with colours – you’ll notice we have mostly browns. If you’re ever photographing someone with even slightly reddish hair, a vivid green works wonderfully. It really highlights where I want this to go in 2016. Though I love posing people for a photo, especially if the pose turns out well, it makes more sense to make them crack up. Here, I had no trouble at all. They cracked each other up. Love this shot. You can see that magical bokeh that comes from the 85mm f/1.2. Although it’s an older lens, it’s one of my favourites. Canon is supposed to come out with a new model this year, but it’s unlikely I’ll buy it. This one is just perfect. After we cracked out the smoke. It really changes the feeling of the photo. I order mine from Rocket.ca. I tell you, that place can be bad for me. 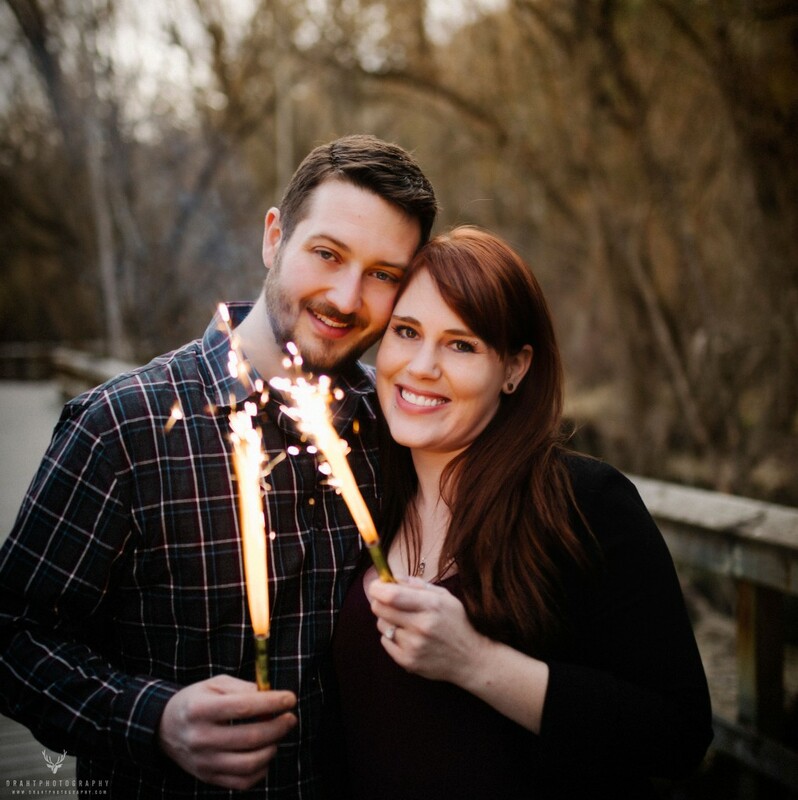 Recently, I spent 250$ on 30ft confetti canons and more sparklers. I don’t need that stuff. But I want it. There’s something so fun about running around with things on fire and smokey things. We got the exact look we were looking for. I’m really interested to see what happens if you set these off on a really sunny day. I can imagine the light coming through the trees would be exaggerated. Something worth trying. 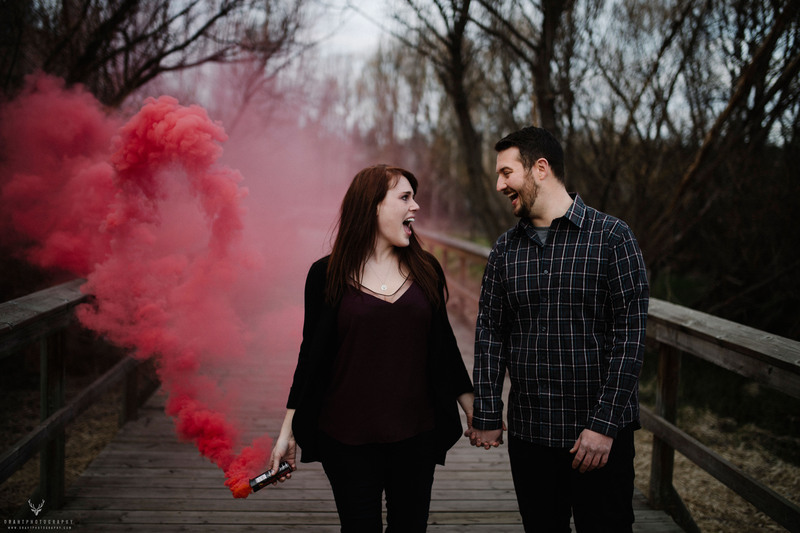 We have a photo walk coming up on Saturday, so I’ll bring a smoke bomb as long as there’s not too many kids. I don’t want to risk anyone choking. 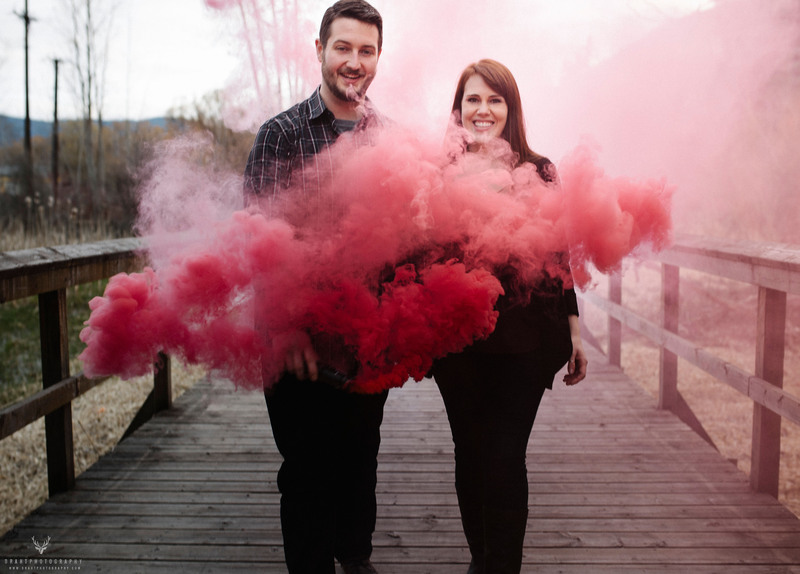 Just for funsies, we broke out the red smoke bomb. These don’t last as long, but they sure are fun. Very thick smoke too. I’m trying to look for smoke tricks. There’s not much out there. I notice when people walk through a cloud of smoke, the smoke tends to cling to their bodies. I should be able to incorporate that into a shoot somehow I imagine. Either way, we got some great reactions. 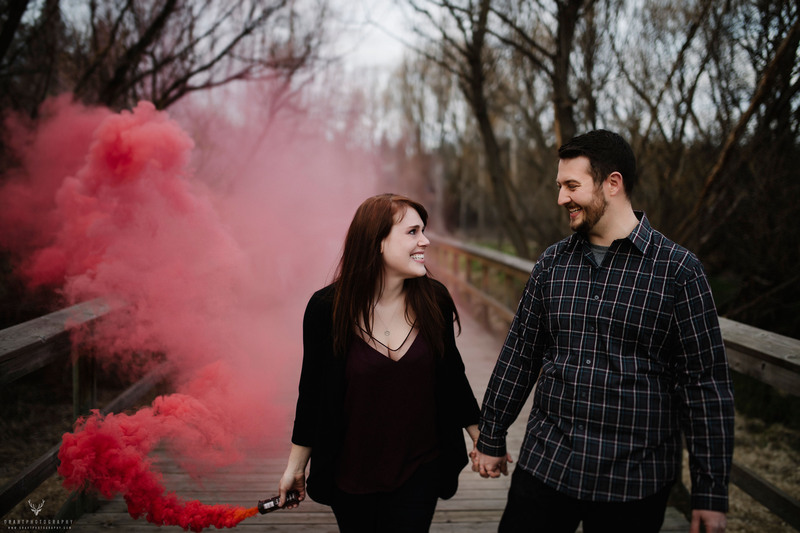 I’ll probably be taking a few smoke bombs to this wedding! 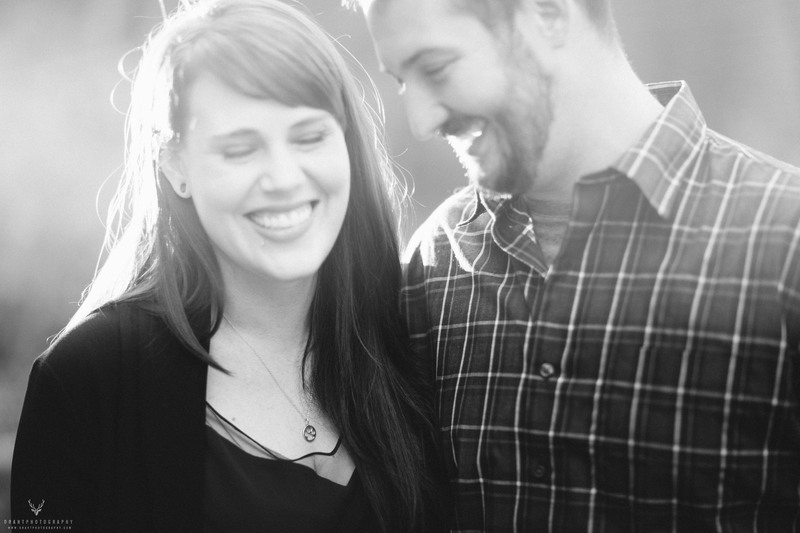 A lot of people think that it’s simply showing up to the wedding to be a photographer, but it’s so much more. 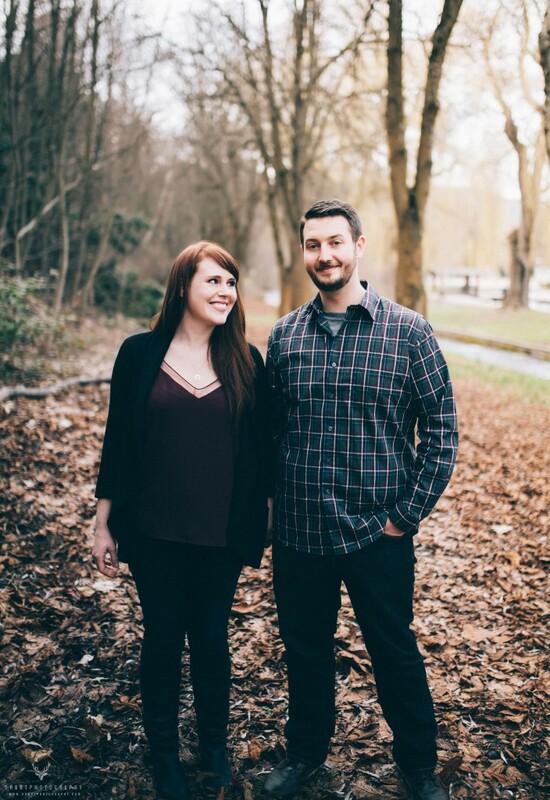 Figuring out angles, engagement shoots, time constraints (this is huge. Never take on more than you can.) Even a second shooter means an extra 20hrs of photo editing. People ask for it to be thrown in for free sometimes, and I have to refuse. Plus I’ve got to pay my second shooter too, so it’s coming out of my pocket. On average, it can take 100hrs to go through a wedding, start to finish. That being said, it’s pretty rewarding. I couldn’t see myself doing anything else. I love it! Thanks for reading this far. Be sure to check up on my twitter, facebook, and instagram to stay updated. Or just drop me line and we can schedule something! 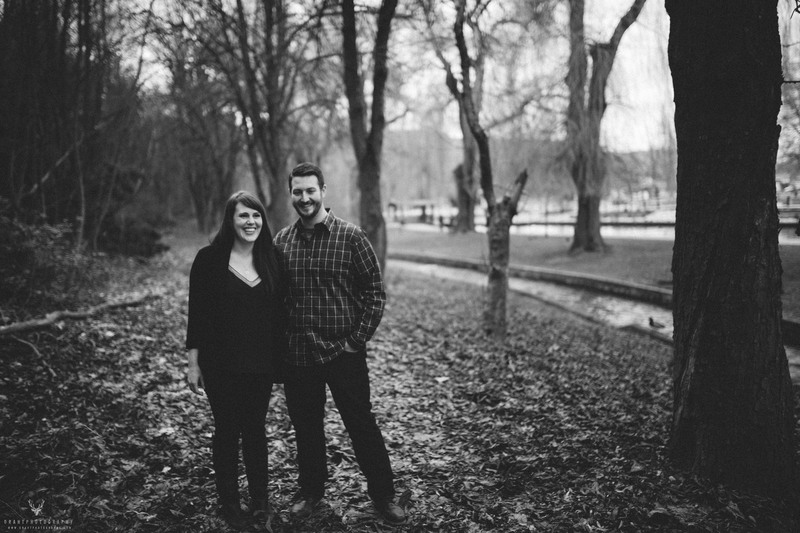 I’m doing a lot of grad shoots and family shoots right now. Talk to you soon! Previous Immaculate Conception Baptism, A Photo Walk, and thank you cards!